Here at Support the Foot, helping people keep their feet healthy and happy is our passion. And we’re proud that our QUICK TAPE® foot support straps help thousands of patients every day—so they can play their favorite sports, gain fitness, and go about their daily lives without foot pain. If there’s one other group who really knows the value of happy, healthy feet, it’s trail runners. Not only are they logging dozens of miles every week, they’re doing it on undulating, uneven, and often unforgiving terrain—and superb foot care is part and parcel to enjoying the sport free from injury. So when we came across these 5 tips for healthy feet in Trail Runner magazine, we knew they were worth a look. Trail runner or not, you can incorporate these tips into your daily routine to keep your feet and ankles strong, flexible, and ready to do what you ask of them—without pain. Each Trail Runner tip focuses on a different aspect of foot health for a well-rounded foot maintenance routine. For example, rolling out the bottom of the foot with a tennis or lacrosse ball (tip #1) can help keep the soft tissues pliable, while practicing balance on one foot (see tip #5) keeps your foot and ankle muscles strong and responsive. The other three tips focus on toe strength and range of motion—particularly of the big toe, which performs the all-important task of propelling your foot forward during running. Trail runner or not, you can incorporate these tips into your daily routine to keep your feet and ankles strong, flexible, and ready to do what you ask of them. Check them out! 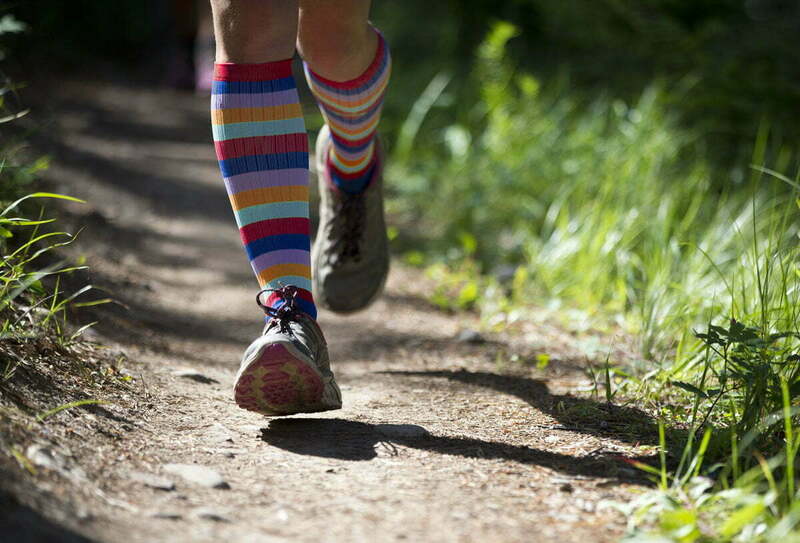 But first…..
We love that the tips from Trail Runner focus on keeping feet strong and healthy—prevention is the best policy—but what if you’re already battling injury? Here’s our tip for how to relieve foot pain without medication or expensive treatments: foot taping with the QUICK TAPE® strap. How does foot taping work with QUICK TAPE®? Our 1-piece, pre-cut strap takes seconds to apply, provides optimal arch support, and helps to align the foot during movement to quickly relieve pain from plantar fasciitis, Achilles tendonitis, shin splints, and more. Because your foot is better aligned when wearing QUICK TAPE®, your knees and hips are also subject to less stress, helping to reduce risk of injury throughout the lower body. In fact, many athletes use QUICK TAPE® during long or hard training periods to help lower risk of injury and keep their feet healthy. QUICK TAPE® also helps to keep your foot aligned and your arch raised while performing foot strengthening exercises like those in the Trail Runner article, leading to even better results. To learn more, check out our intro to QUICK TAPE® here, or contact us for information about ordering. Happy trails to you!